James Otis, a Harvard-educated scholar of literature and law, was prominent within colonial Boston's political, literary and intellectual circles. In 1764 he published The Rights of the British Colonies Asserted and Proved, with two appendices: a memorial written by Otis to the Boston representatives to the General Court, and instructions to them from the May, 1764 Boston Town Meeting, drafted by Samuel Adams . 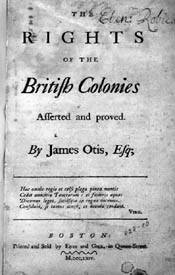 In a brief section entitled "Of the Natural Rights of Colonists," Otis wrote: "The colonists are by the law of nature freeborn, as indeed all men are, white or black." Otis was one of the few writers of the period to incorporate an attack on the institution of slavery into the Anglo-American debate on liberty from Britain. Within a year of publication, the pamphlet was reprinted in London and advertised as "universally approved" of in the colonies. While it was the most widely known and commented upon political tracts published in the year between the passage of the Sugar Act and the passage of the Stamp Act, approval was far from universal. Writers from a broad political spectrum attacked Otis, destroying his reputation as an American spokesman. Otis's later writings on American rights repudiated the entire pamphlet.